My car, Bear, taking a nap in her bed next to me. I've included Pumpkin in several of my pics this year, but have not given Bear her own photo ops. 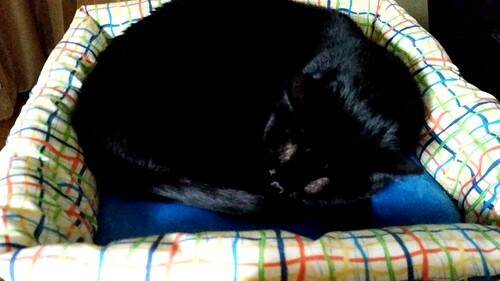 Today, while pondering what to take a photo of, I looked next to me and there was Bear, napping peacefully. I knew I had my photo of the day. She generally likes to nap where her humans are. If we're not around, she will opt for different places--a bed, the window, and elsewhere. But if we're here, she's near us. At some point soon, she'll awake and do her stretching and then come over and give me a headbut. She's definitely the more alpha cat, but that doesn't stop her from wanting regular affection and staying near her humans.